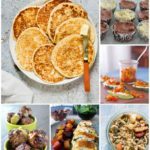 Sick of eating eggs for breakfast on the keto diet? 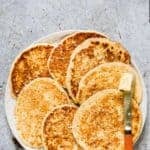 Perfect Keto Pancakes are a simple, easy-to-make pancakes recipe for keto dieters, low carb dieters, or anyone who wants a low-carb breakfast option. I am convinced that a world without pancakes would be a very sad place indeed. 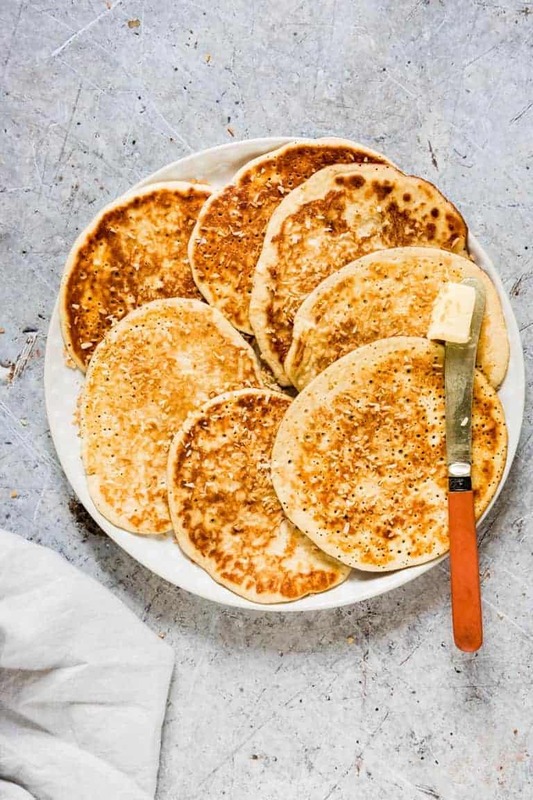 We eat pancakes a LOT in my household – three times a week minimum for breakfast, brunch and dinner, but if I’m being honest it’s usually at least four times. And there was that one week it was so many times that I’m embarrassed to post the final count on the internet. Needless to say, I think I’m pretty good at making pancakes. Potato Pancakes, Beghrir (Moroccan Semolina Pancakes),… I could make pancakes in my sleep. 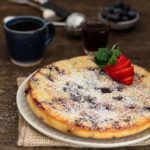 What I love about this Keto Pancakes Recipe I whipped up is that a keto diet is certainly not required to enjoy them. 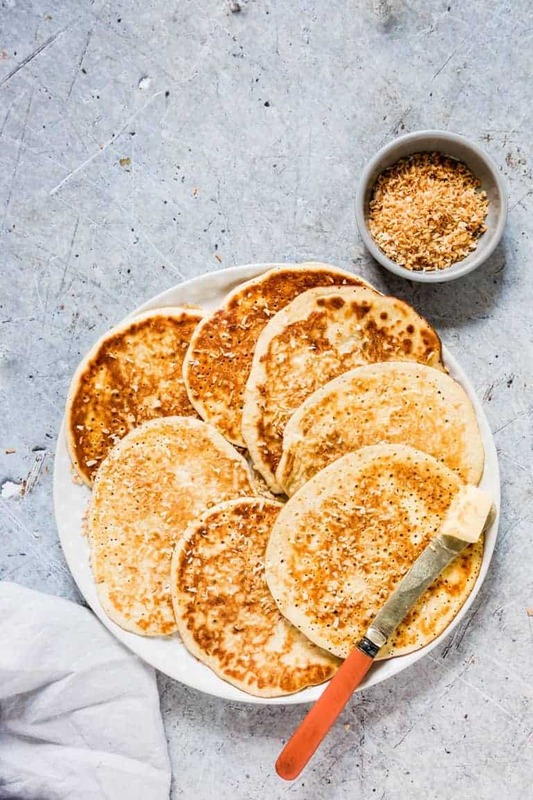 The recipe results in light, crepe-like pancakes that you can drown in butter, whipped cream, nut butter, sugar-free syrup, or whatever topping you’d like. 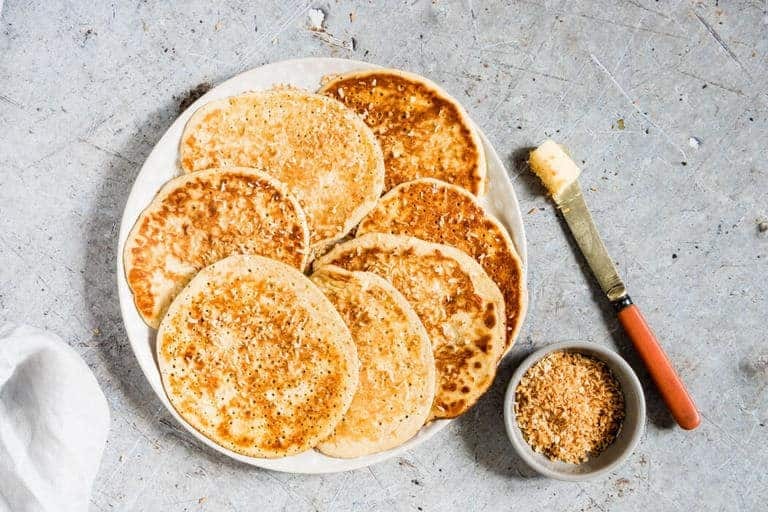 Yeap, I’ve named these ‘Perfect Keto Pancakes.’ Perhaps that name is a lot to live up to, but with my expert pancake-making skills, I feel pretty comfortable in saying this ketogenic pancake recipe is pretty much perfect. No more eggs for breakfast. My friend who is on the keto diet said she was on egg overload and could barely stand to look at another egg. Whilst this recipe does contain eggs, it’s only 4. These are not ‘eggy’ pancakes like some keto pancakes. Only 5 ingredients. 6 if you count the butter you use to fry them. These are some seriously easy Keto Pancakes. This is seriously the easiest low carb pancake mix you can ever whip up. They’re keto cream cheese pancakes. The addition of cream cheese makes them extra-tasty and soft. They can be easily sweetened. If you prefer a sweet pancake, add stevia or another low-carb sugar substitute to your liking. 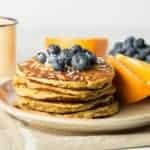 Here are some of the items you will need to make these Keto Pancakes. 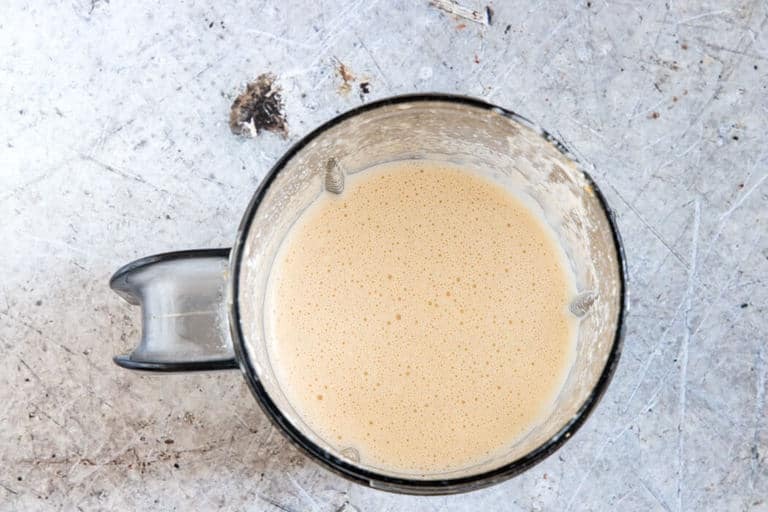 The key tool you would need is a blender to whizz up the batter in. Some measuring jugs or cups or measuring teaspoons will be handy too. Grab hold of a frying pan and a silicon turner. Don’t forget some almond flour and this fragrant vanilla extract. Step 1. 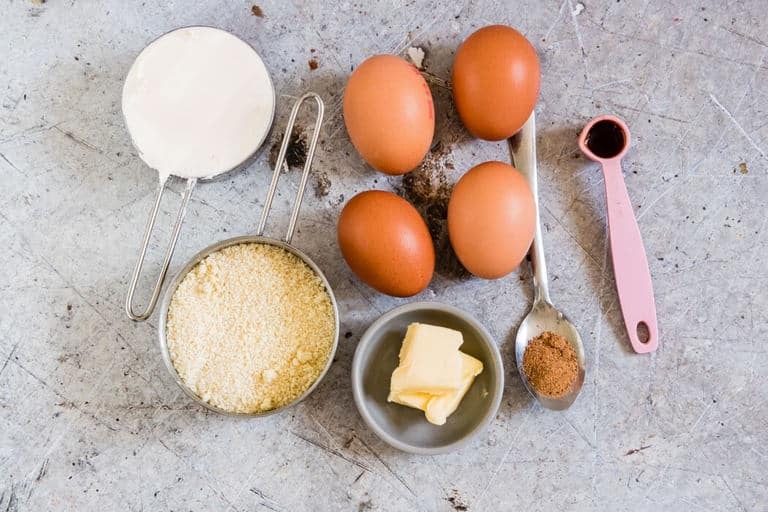 Gather your ingredients (almond flour, cream cheese, eggs, vanilla extract, and ground nutmeg) and add them to the blender. Step 2. Whiz until combined. Step 3. Over medium heat, heat butter in a frying pan. Add about 2.5 tbsp of batter per pancake. Fry on one side till they begin to bubble and flip to the other side. 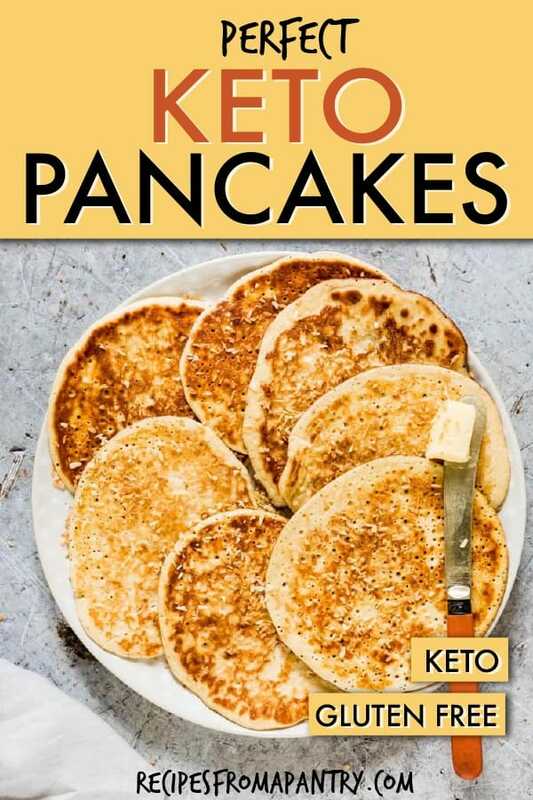 Isn’t this just the easiest Keto Pancake Recipe ever? 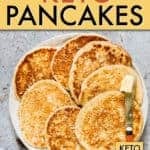 Here are a few Keto Pancake topping ideas to try. For Low carb Protein Pancakes, you would substitute the almond flour for some protein powder instead. The pancakes turn out really great as well. Feel free to also throw in a few sugar-free chocolate chips in too. 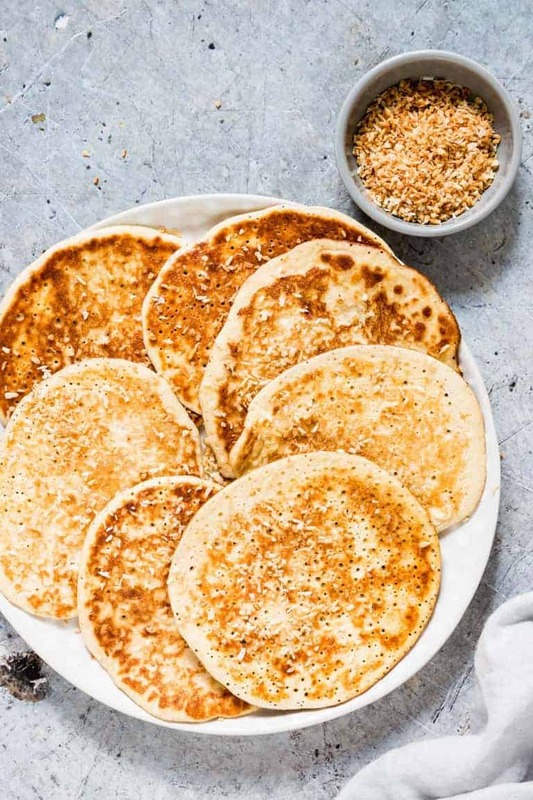 Perfect Keto Pancakes aren’t quite ‘no carb,’ but close. Each pancake contains only 2g net carbs. (Find out the rest of the nutritional info on the handy nutrition label below the recipe.) See this is the perfect Keto Pancakes Recipe. 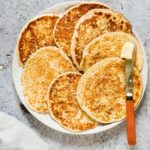 Whilst these are Keto Pancakes with coconut flour, you can also make these Keto Pancakes with coconut flour. Just make sure to keep the pancakes small when frying them so that they hold together. Can You Freeze Low Carb Pancakes? Great question. You can wrap these pancakes up individually and freeze them for a couple of weeks. If you prefer you can just keep them in the fridge for 3-4 days no problem. They are certainly a good option for those who want a low carb grab and go treat and can be a great addition to any low carb meal plans. 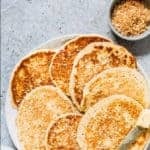 These easy Perfect Keto Pancakes will save you from eating eggs for breakfast yet again. My friend sure does love them – in fact, she told me she sometimes eats them four or five mornings a week. And she’s still losing weight because she’s able to stick to her diet. Pancakes for weight loss… who knew? Here is a quick video that explains it for those of us who think plantains are keto… (they’re not, I have learned). Just a little note here that the recipe calls for Almond flour, which is different from ground almonds. Almond flour is much finer (so is closer to regular wheat flour) than ground almonds. To be honest I use either when I have them and I like the slight difference in texture when using the different versions. Why not try this yourself and see. Thank you for reading my Perfect Low Carb Pancakes recipe post. And please come visit again as I continue dreaming up recipes, traditional African recipes, African fusion recipes, Sierra Leone recipes, travel plans and much more for you. 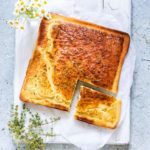 Thanks for visiting Recipes from a Pantry, UK food blog. Don't forget to tag #recipesfromapantry on Instagram or Twitter if you try Perfect Keto Pancakes! It is really, really awesome for me when you make one of my recipes and I'd love to see it. You can also share it on my Facebook page. Please pin this recipe to Pinterest too! Thank you for reading Recipes from a Pantry. 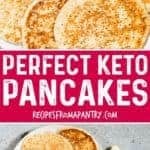 These Perfect Keto Pancakes are yummy and easy to make. Add all the ingredients into a blender and blend until combined. Heat butter in a frying pan over medium heat and add about 2.5 tbsp of batter per pancakes. Fry on one side till they begin to bubble and turn over and fry on the other side. Serve warm and top with desired toppings. To make a sweeter pancake, add the keto-friendly sweetener of your choice. These pancakes are a great alternative to eggs, and suitable for all kinds of delicious combinations. I do like to avoid carbs as much as possible for breakfast, I feel they make me lethargic. Something like this is ideal, I’d probably chose yogurt and berries to go with them. good looking pancakes! We’ve gotten into a pancake routine on Sundays, though our angle is eggless pancakes due to a food allergy. 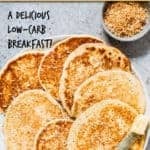 These sound so interesting I’ve never made low carb pancakes before but I’m so going to try these! Wow. These look perfect. Definitely trying them for breakfast. The best breakfast to stay healthy and burn fat! Delicious and healthy all in a simple pancake with less than 10 ingredients! Thank you for sharing such an amazing recipe! ALL the love! Hey Christy – underneath the Ingredients, you will see the option to convert recipes to USA measurements. I hope that helps?? The Nutritional facts above are for 1 pancake correct? The Nutritional facts are for what size Pancakes? picture looks maybe 4 or 5 inches 🙂 Thank you as well for doing this it really helps out. Yes, per pancake. I cant remember how big they were, I am sorry. I realize this is over a year since you posted your question, but I figured I would leave a comment for anyone else that has stumbled across this like I have. As far as the size of the individual pancake goes, the recipe says to use about 2.5 TBS of batter per pancake. I’m very happy I found this recipe, I can’t wait to try it! I love pancakes and have been missing them. Thanks for saving me from egg overload! I was so excited to try these low carb pancakes! However, I did not have a good experience making them. I followed your instructions, but I used coconut flour instead of almond flour (my boyfriend has an almond allergy) I didn’t think it would make a difference, but when I put all of the ingredients into the blender the batter came out so thick. I wasn’t sure if this was how it was supposed to be so I tried to cook a little in a pan and it just was not coming out right. I had to throw the batter. I may have just needed to add more liquid like water to make the batter less thick. I hope next time I have success with making these! They look so yummy! Thank you for sharing your recipe! Coconut flour soaks up all the moisture. You would have needed to have not used as much maybe 3/4th of what the recipe called for. Any ideas on how to make these savoury? I’m assuming vanilla and nutmeg are just for flavour? These are my to go pancakes and I love them so much. So close to the real thing. You have to try it!! Thank you so much for actually having a “convert to US measurements” option. I go to so many sights with grams and no conversion! How many are we suppose to it in one breakfast. ?